Ok, this is a little silly. A really long post about oatmeal and recipes on how to make it. But this isn´t so much about following the recipes, more as an inspiration, or a reminder of good oatmeal is for you, how versatile and easy it is to make, and not at least how tasty it can be! Sure I did! Like many guys, he didn´t share my enthusiasm for oatmeal, because he, like many other, had bad experiences with oatmeal growing up. And he didn´t know how to prepare it either, either turning it into a dry mass, or too watery, almost soupy-like. So of course, this guy probably wouldn´t prepare it anyway, since his idea of oatmeal was equal to a nastylooking and tasteless thing. Not that it´s rocket science to prepare a bowl of oatmeal, but it almost seems like it, when you can accomplish so much with so little effort! 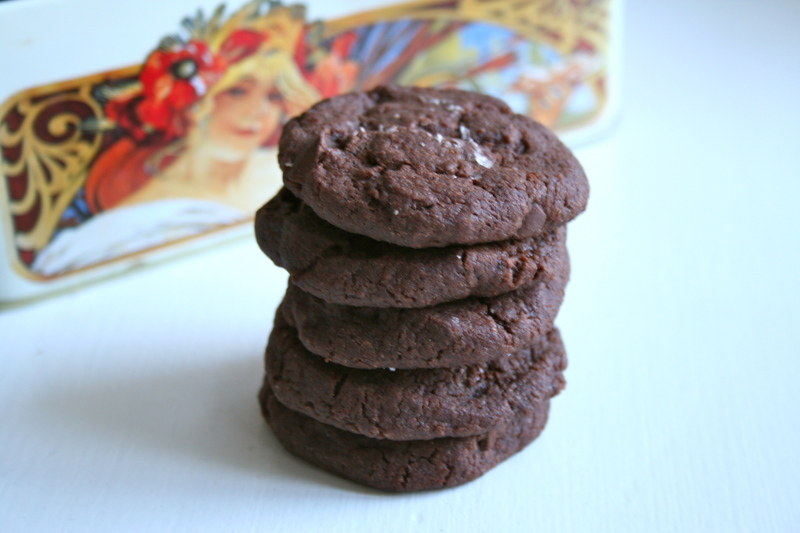 From dull to delish in an instant! You better try. You owe it to yourself to try a decent bowl of oatmeal for breakfast every now and then. And who knows, maybe you´ll be an oatmeal-convert too? I recently convinced my mum, who had a strong resistance against oatmeal due to childhood overdose. I particularly like oatmeal for breakfast this time of year, when it´s cold outside. It´s such a comforting breakfast for cold days, warming you up so you´re prepared to leave the house! I make my oatmeal in many different ways. Or actually, come to think about it, I don´t. But what I add to the oatmeal depends on what I have or what I´m in the mood for. And the key ingredient, which isn´t an ingredient at all, but a method, is to soak the oats overnight. I find that really makes the oatmeal a lot better. Soaking also make the oats more digestible and help your body to absorb the minerals from the oats. And, it reduces the cooking time – which is always a plus in the morning! My toppings usually consist of some kind of fruit, some kind of nuts and something creamy: Fruity+Crunchy+Creamy. I always have roasted almonds around, because I simply cannot live without. Fruit/Berries can be whatever´s in season, or whatever you prefer, and nut butter, youghurt, applesauce can be the creamy component. But these are just suggestions, and my personal preferences, but of course any toppings and combinations can do! This is my favorite at the moment. I love persimmon, and now that the season is here, I want as much of it as possible. So I included it in my bowl of breakfast oatmeal, with great success! Add the oats, water, milk to a saucepan and allow it to heat for about ten minutes, until the liquid has all been absorbed. Serve with chopped apple and roasted almonds, and a good dollop of dulce de leche with a sprinkle of sea salt on top, giving it a lovely luxury touch. This has become another favorite lately, after I made my own very delicious applesauce of the tasty Norwegian apples in season right now. Of course bought applesauce is good too, but if you have access to good flavourful apples, it´s really worth it and easy to make your own. Add the oats, water, milk to a saucepan and allow it to heat for about ten minutes, until the liquid has all been absorbed. Serve with a tablespoon of applesauce, youghurt and a handful of your favourite nuts or a muesli. Add the oats, water, milk to a saucepan and allow it to heat for about ten minutes, until the liquid has all been absorbed. Serve with chopped apple and roasted almonds, and a good dollop of dulce de leche. I can´t really take credit for this one, but thanks to GRØD who put oatmeal in fashion and popular, this has become one of my (and their) all time favorites. Usually I get excited for autumn which is my favourite season above all. When it gets here I’m all about scarves, candles and apples and cool weather. I just wish it would wait a little bit longer. As much as I love autumn, I’m not quite ready for summer to be over. Particularly since I don´t feel it´s been a summer at all this year with low temperatures and lots, lots of rain. But luckily the last weeks we´ve had several days of sun and heat, and I was reminded that I’m not ready to move forward into autumn yet. I want more summer! The good things about autumn though, is the abundance of (Norwegian) plums and apples which are my favorite fruits. On the downside, it´s the end of nectarine season, which is another favorite of mine. So the last days I`ve been buying a lot of nectarines, just in case it would be my last chance. This nectarine pie might be my last chance to celebrate stone fruit for awhile. Be sure to make it before the nectarines have vanished for the year! Each bite of this sweet, decadent pie tastes like summer. Even if summer never was here, this pie makes it feel like it. In a large bowl, combine flour and salt. Cut in butter until mixture resembles coarse crumbs. Stir in water, a tablespoon at a time, until mixture forms a ball. Wrap in plastic and refrigerate for at least 30 minutes. Roll dough out to fit a 9 inch/22 cm pie plate. Place crust in pie plate. Press the dough evenly into the bottom and sides of the pie plate. Slice the fruit in half and remove the pits. Place the nectarines flat side down and cut into thin slices. Place the sliced nectarines in a large bowl and toss with cornstarch and half of the sugar. In a small bowl, stir together egg, grated marcipan the rest of the sugar and salt. Arrange the sliced nectarines on top of the filling in any way you like. Or don´t arrange them at all, and just toss them over. Still pretty, and equally tasty – but less fuss. For once I took the time to make a litte effort arrenging the fruits. Sprinkle with sugar and bake on 180 C for 40-50 minutes, or until the crust is golden and the filling is bubbly. Allow to cool completely to room temperature before slicing (the filling will thicken as it cools). Enjoy with a dollop of creme fraiche and savour the sweet, juicy taste of summer! The pie was very sweet, so I think one easily reduce the amount sugar, or even omit it. The nectarines are sweet on their own, and even more so after they´re baked, and the marcipan also adds sweetness. But don´t leave out the marzipan, as it makes the filling sweet, but also buttery and creamy. So that will be at your own risk. I have tasted Hindbærsnitter twice in my life. 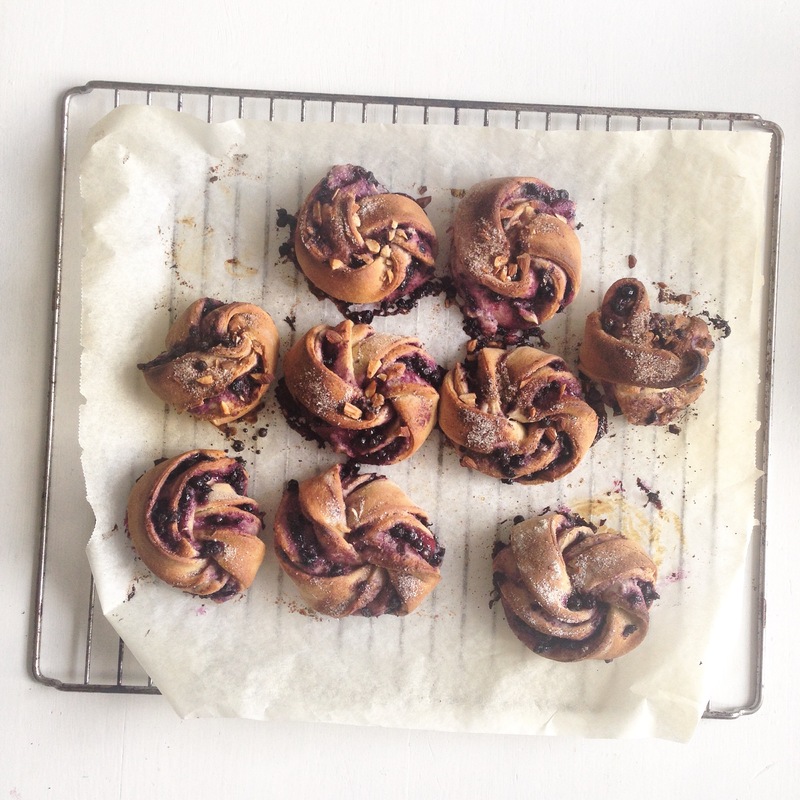 Today, making these, and a year ago, when I made my first batch ever of Hindbærsnitter. This was embarrassingly enough also my first taste of hindbærsnitter after 5 years in Denmark, where these sweet pop-tart-looking things appear and are sold in every bakery you go by. 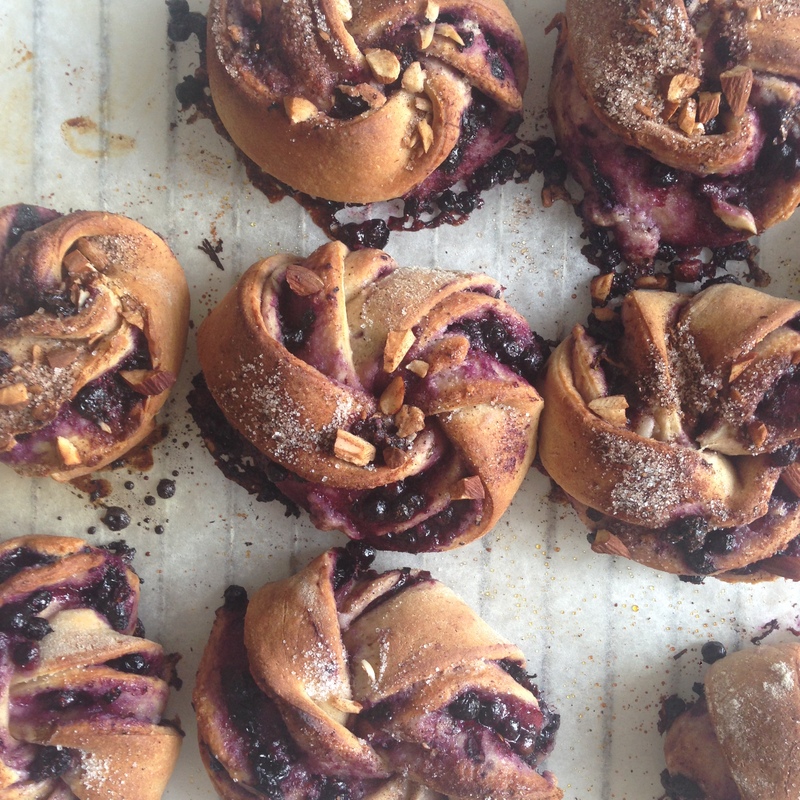 And lord knows I´ve been around those Danish bakeries quite often, so I´ve had several opportunities to try them out. Buuut there were always some Cinnamon-rolls or other tempting goods that got in the way, so I never really got around to it. But last summer I made a lot of raspberry marmalade, and I needed to put it to use, so I thought of the so-called Hindbærsnitter and decided to give it a go. And it was good, I tell ya… And I couldn´t help but thinking: What took me so long? Why haven’t I tasted them before? Like I remembered, they were lovely. Really sweet both by their look and taste. I might have gone a little overboard with the frosting, but who cares. 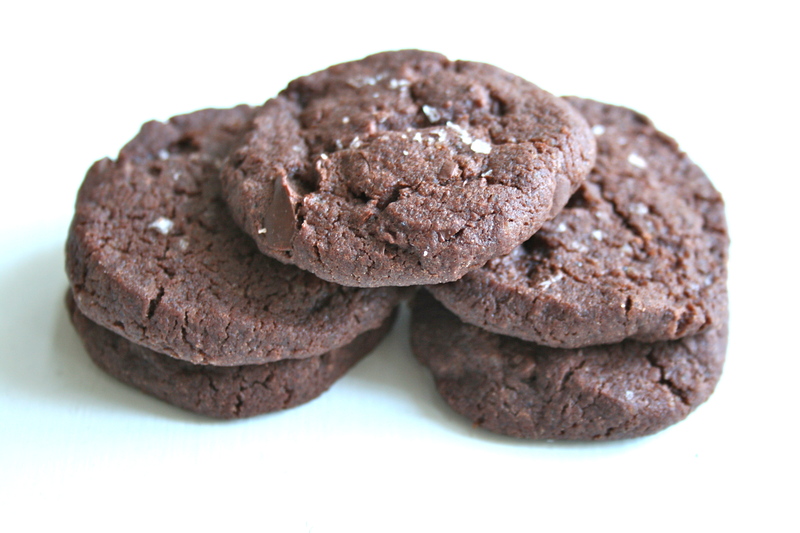 Days like these crave sugar…! Preheat oven to 200 degrees C and line two baking sheets with parchment paper. Make the dough: Stir together the flour, sugar, and salt. Work in the butter with your fingers, pastry blender or food processor until pea-sized lumps of butter are still visible, and the mixture holds together when you squeeze it. If you’ve used a food processor, transfer the mixture to a large bowl and add the egg. Mix just until everything is cohesive, kneading briefly on a well-floured counter if necessary. Make the tarts: Divide the dough in half, and place on a lightly floured work surface. Roll the crusts with a rolling-pin into a size of 12×25 cm and 3-4 mm thickness. Bake in a preheated oven until the edges are lightly golden brown, about 10 minutes. 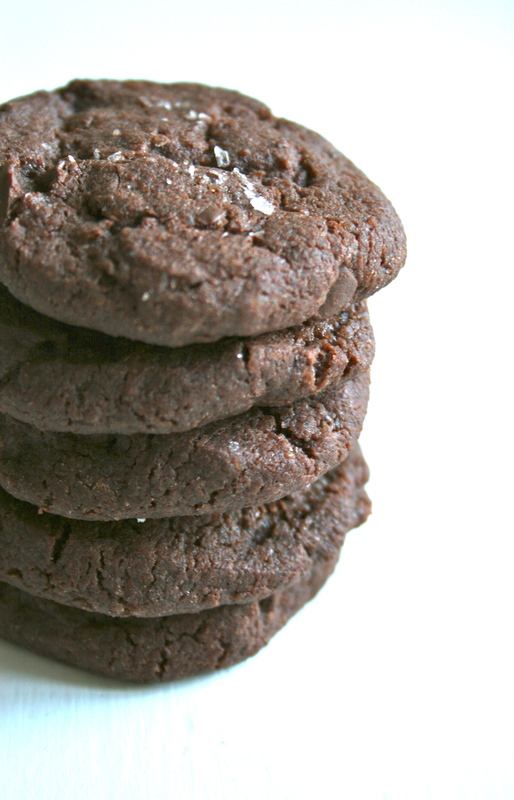 (Be sure to keep an eye on them, time depends on how thin you roll them) Allow to cool on the baking sheets. Meanwhile, stir together the confectioners’ sugar and water/lemon juice and make a spreadable frosting. It should be quite thick. Spread one of the cooled tarts with frosting and sprinkles. (I used freezedried berries) Spread raspberry jam out on the other pastry. Sandwich them together, the frosted pastry on top of the raspberry spread. Press them a little together if you manage, and cut into (in)appropriate sizes. Serve once the frosting is completely set or not, if you can’t wait (like me) and like it a little soft and sticky. Now all you need is a blanket and a cup of hot beverage, and something to read, and the summer-rain can just keep coming…cause I´ve got hindbærsnitter, the perfect accompaniement on a rainy day! 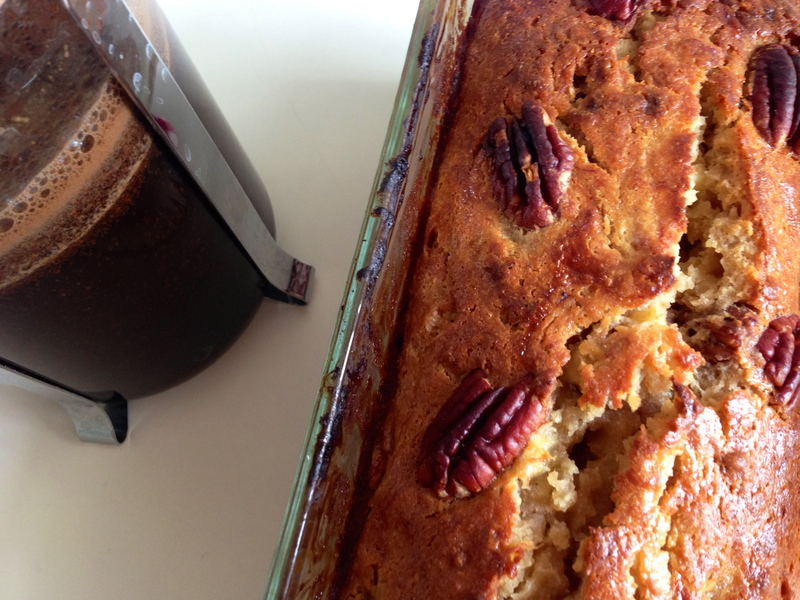 Super moist bananabread with pecans! Actually, I had kind of let them overripe on purpose, so I could have an excuse to bake with them! But only partly…My mother bought all kinds of food, and pretty much filled my fridge and freezer before she left, so it was inevitable that something would – not go to waste – but, end up in baked goods. Maybe that was her plan all along. Ahh, she knows me too well! So, Sunday came, the bananas were brown as ever, and I had cake-cravings! Off to the bookshelf to find a nice recipe. I do have a couple of winner banana-bread recipes, that are just amazingly good, but I´m kind of in this getting-to-use-my-cookbooks-flow for the moment, so I grabbed three candidates and started the search. I almost turned to Dorie, again, but then it would be a bundt, and not a loaf. I wanted a loaf. And I feel with her, I shouldn´t change the recipe too much, I have a feeling it´s best to leave it to her. And I wanted to use some yoghurt and nuts, cause that´s good stuff in a banana bread. 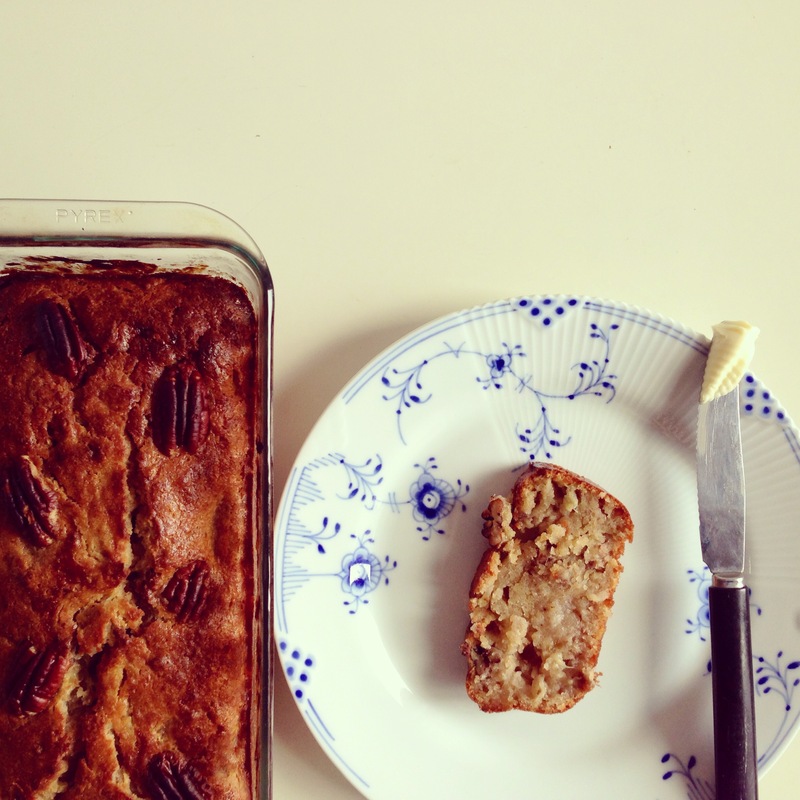 So, finally, I picked the banana pecan bread, from Leila Lindholm´s Piece of Cake. The picture of that bread was one of the first things that got stuck on my mind from that book, along came many other things… And one of the reasons I got the book! Besides, it´s so pretty! But, I haven´t really baked anything from it yet besides a bread, so it was about time I started the serious business – on to the cakes! I adapted the recipe slightly, substituting some of the butter with yoghurt, powdered sugar with sugar, and some of the flour with whole wheat, but the original recipe goes like this. And I only had 3 bananas… But I don´t have the measurements I used, so I present to you the original recipe! Stir the sugars and butter light and creamy. Mash the bananas (keeping a few chunks if you like – I know I do!) and stir them into the batter. Add the eggs. Mix the dry ingredients and pecans, and gently fold them into the batter. Pour into a buttered loaf-pan, and bake the cake for about 30 minutes in the center of the oven. (Mine needed longer) A toothpick inserted in the center of the cake should come out clean. Allow to slightly cool, and dig in! This cake can be served pretty much any way you like: Warm or cold, with our without butter, nutella, ice cream….you get the picture. I thought it was really good straight from the oven, warm and nice, so that the butter I added just melted into the cake. But on the other hand, it´s also really good the second, or third day, when it has had time to set – then you really get the moistness of this cake… Yummy either way! I´m home on holiday – again! I know!!! That´s the advantage of having my exam after Christmas – getting an extra vacation! So, that´s pretty nice… I came home last weekend to Celebrate my boyfriend´s mother´s birthday, cause she was turning 60, and having a big celebration. And the plan was to fly back on Sunday for my exam the following monday. But, it turned out, that after my exam there weren´t any lectures until February! And as the exam was a home-exam, well, why not stay at home in Norway writing it? After all, that is my primary home! So I did! And now I have a good week at home to do – well – bake? It´s not like I have anything else scheduled! Well, other than seeing family and friends, of course. But those things are very well combined. Last night, I had a friend over while my boyfriend was at football practice. Our initial plan was meeting at a café and then going to the cinema, but poor as we are, we decided on a night at home instead. And then I found these. They looked insanenly good. I was a little surprised to see that the brownies were made of cocoa, not chocolate, I mean, being a brownie, and all! 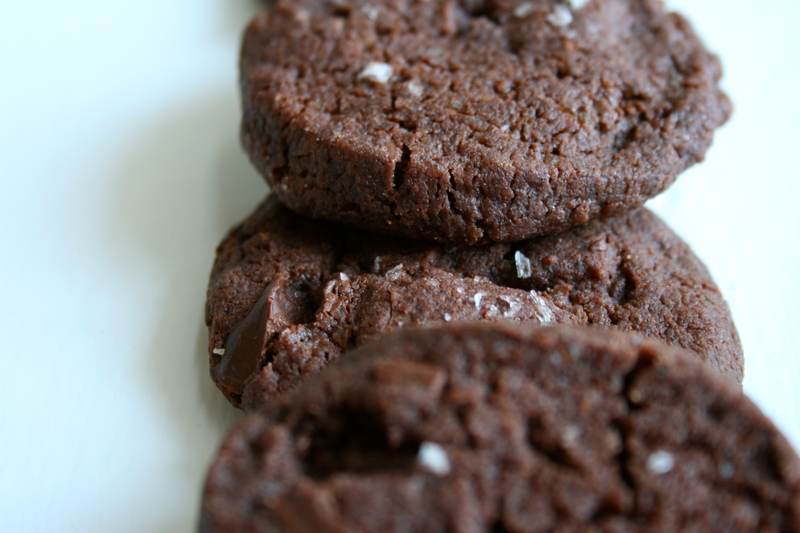 And still – they looked so chocolatey! But, than again, I do recall a super-moist chocolate cake made from cocoa, so that didn´t put me off! 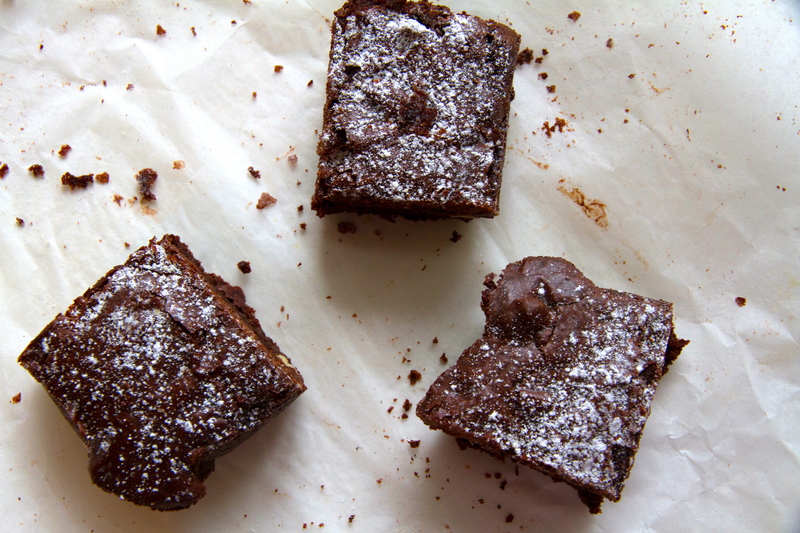 I was a little afraid that the basic Hummingbird brownies weren´t gooey enough, or fudgy enough to my like, cause I couldn´t really judge by the photos. 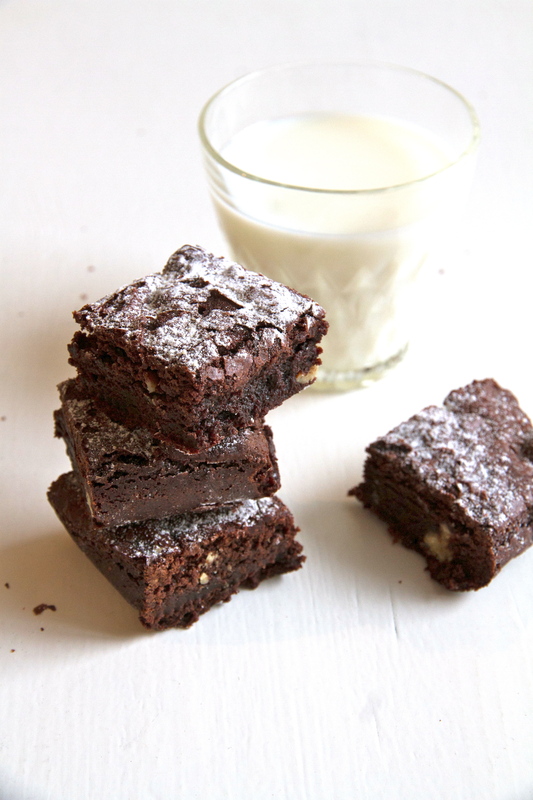 And to me, that´s what brownies are all about. 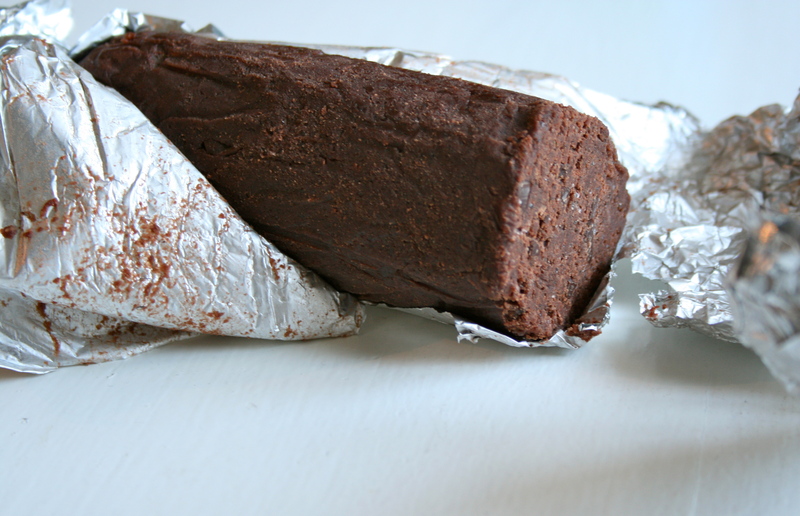 Fudge and goo – yes please! I realized that the ingredients and measures in the cocoa brownies were the same as another Hummingbird-recipe, the frosted one, though without the frosting… So, I decided on that one, and got to use the book after all! I just tweaked the methods, to go with Alice Medrich´s approach. 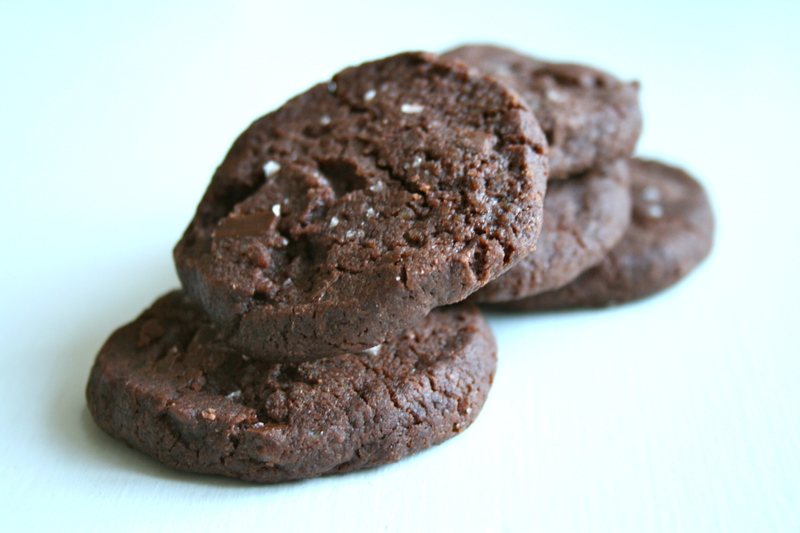 And also with her addition of browned butter…..mmm. So, I never managed to bake the brownies before my friend arrived. But what´s good, is that these brownies come together in no time! Cause we were gonna have brownies, that was for sure! I just whipped them together in a hurry after dinner, and within an hour, they were served! 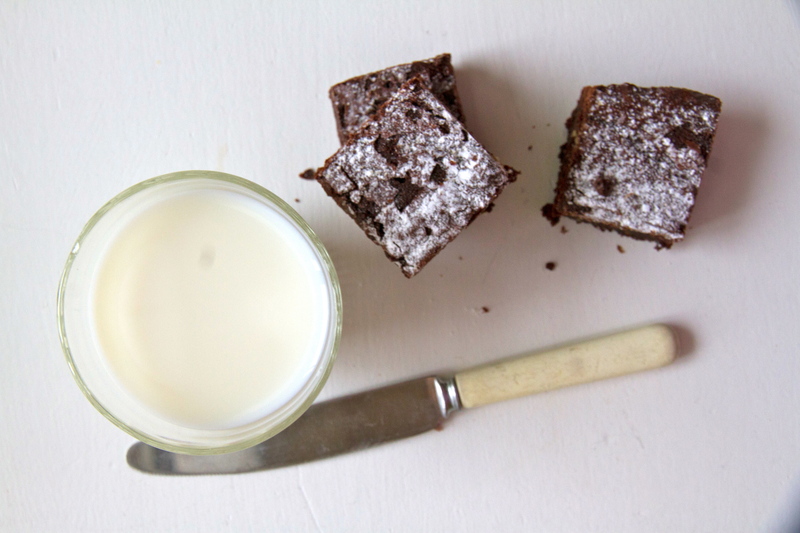 And maybe it was just as good I didn´t bake them in advance, because what´s better than warm, fudgy brownies, straight from the oven?It was the perfect accompaniement to Bridesmades, a glass of milk and good company! 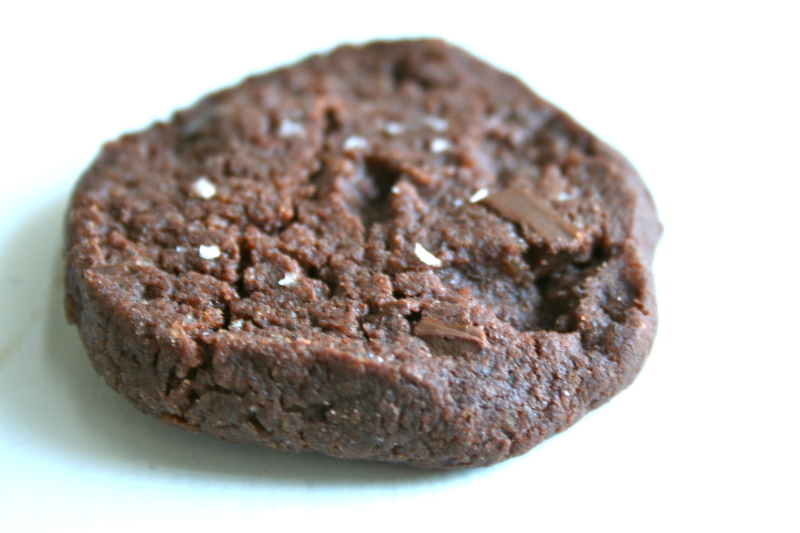 Verdict: Fudgy? Check! Chocolatey enough? Check! Good? Hell yeah! 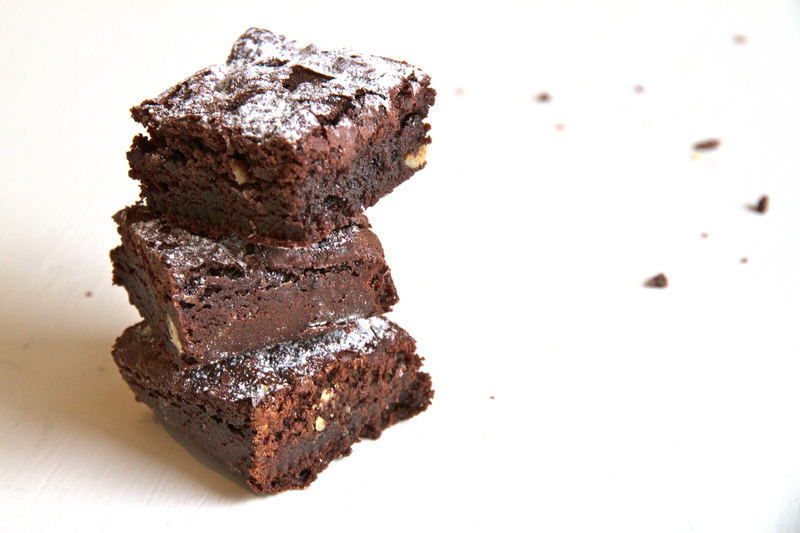 So yes, the brownies lived up to their expectation, and to the photos – Luckily! Add the eggs one at a time, beating vigorously with a wooden spoon or a silicone spatula after adding each one. When the mixture looks thick, shiny, and well blended, add all of the flour and stir until you no longer see streaks of flour, then beat vigorously for 50 to 60 strokes with the wooden spoon or the spatula. Stir in the nuts. Spread the batter in the lined pan, swirling the surface if you like. Bake for 20 to 25 minutes, until a toothpick inserted into the center emerges almost clean (the brownies will still be soft and gooey even if the toothpick looks clean). Cool in the pan on a rack. 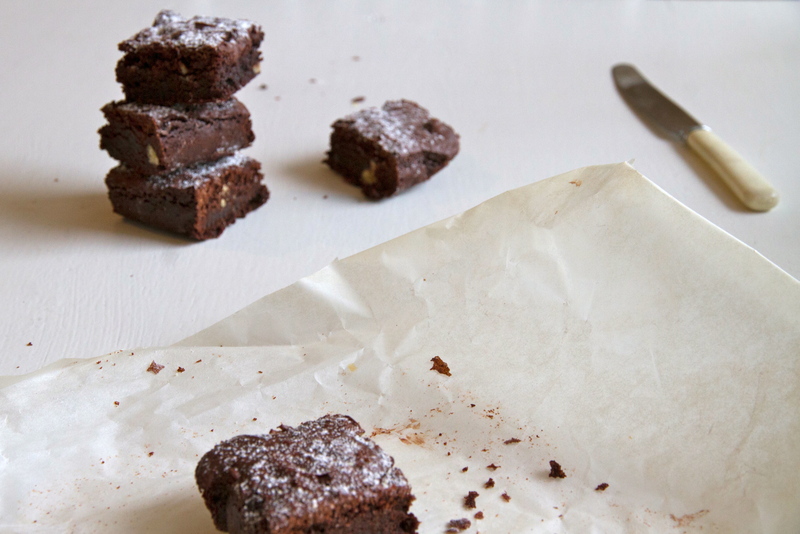 Lift the edges of the foil liner and transfer the brownies to a cutting board. Slide a metal spatula under the brownies to detach them from the foil (or invert the brownies and peel off the foil, then turn the brownies right side up again). Cut into 16 or 25 squares. The brownies keep stored airtight, for 2 to 3 days.